Here’s how I did it. For the scouring and tannin details, you can read my last post. For the copper mordant, I used the ratio of half an ounce of copper sulfate per pound of fiber. For the quantity of the cloth I was mordanting, that was about a tenth of an ounce of copper. I dissolved the copper crystals in a stainless steel pot, then I intended to follow Jim Liles’ instructions and heat the mordant bath to 150 degrees. It got a bit too hot, up to 200 degrees, while I was busy with other dyepots, so I added some cold water and took the pot off the heat. Then I waited for it to get back down to 150 degrees before adding the wetted-out cloth. 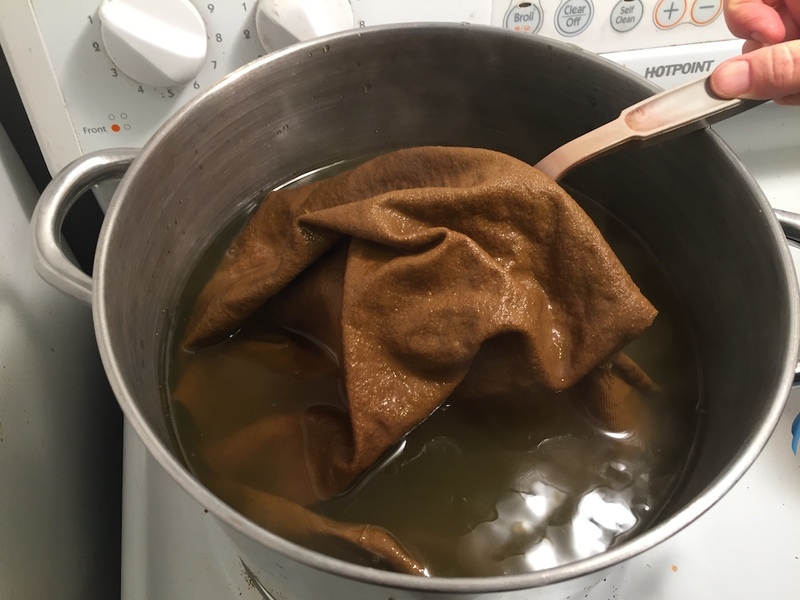 Once I added the cloth, I kept the temperature as close to 150 degrees as I could for an hour, then let the cloth sit and cool in the mordant bath overnight. For the weld bath, I used a 1:1 ratio of plant material to fiber, and extracted the dried weld tops three times over two days. For the first extraction, I added water to the chopped up stalks, leaves, and flowers, brought the temperature up to about 150-160 degrees F, and maintained that temperature for an hour. Then I shut off the heat and let the plant material cool and steep overnight. The next day I strained off the dye liquid and repeated the process first thing in the morning, but I only let the plant material steep until the evening. I strained off the second bath, and extracted the plant materials a third time that night. The next day I combined all three extractions, and added half a teaspoon of calcium carbonate to the dyebath. The pH was only between 7-8. When I first added the cloth, I was not very pleased with the color. 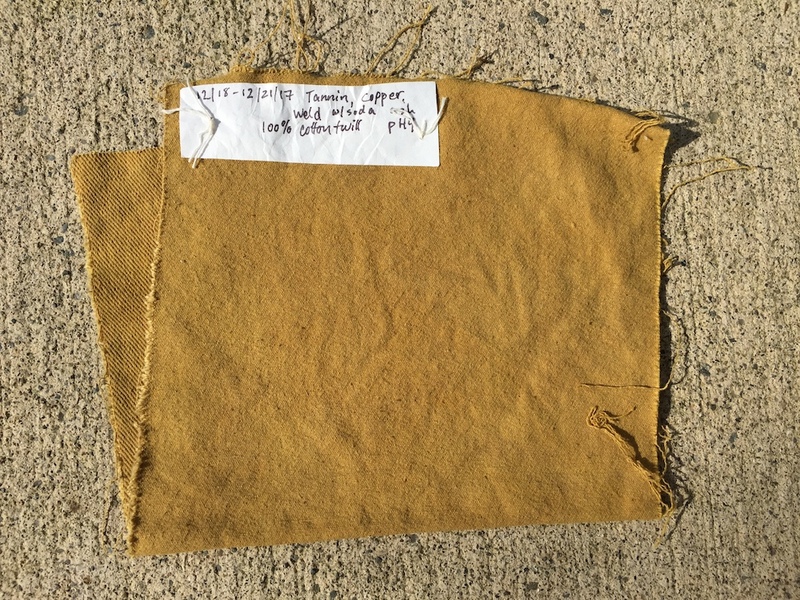 It takes time for color to develop with natural dyes, but you can often get a sense of what might be happening with the first color “strike”, or how the fiber first takes in the color. I felt it was drab and uninspiring. Fortunately, I know that weld is pH sensitive, like many dye plants, so I pulled out the cloth and stirred in half a teaspoon of dissolved soda ash. This brought the pH up to 9. When I re-introduced the cloth, it was much brighter. Yay. At this point I stopped writing down notes or taking photos. I was running several different dye experiments that week, in an overly-ambitious whirlwind of winter vacation before heading off to celebrate Christmas festivities with my family. Oh, and buying a car. Typically I would heat a weld dyebath to not higher than 180 degrees, maintain that for an hour, then let the fiber cool in the dyebath overnight. Then I pull out the fiber to dry completely before washing and rinsing. Let’s assume that’s what I did!